Is there any other phrase read or heard more often in the 21st century than, “Flying under the radar?” Or the shortened version, “Under the Radar?” I can’t think of a single saying that is used as frequently or as universally by so many different people in so many different settings… sports, economics, politics, business, science, and everyday life. It’s one of those unique colloquial expressions that (originally) literally meant an aircraft flying so low to the ground that it couldn’t be detected by even the most advanced radar systems. How often have we seen a movie where US fighter jets flew “under the radar,” and successfully accomplished their mission of taking out enemy fortifications? But somewhere along the way, under the radar took on a life if its own; becoming a metaphorical idiom to explain how something or someone rose to prominence or achieved something extraordinary without being detected, until everyone realized what had happened. Moreover, the figurative use of the phrase has superseded the literal meaning in frequency and significance. As is the case with other idiomatic phrases such as, “fight fire with fire,” or a “cat and mouse” game. If I’ve seen the term once, I’ve heard it a hundred times just in the arena of sports alone. Such as, “The Kansas City Royals have flown under the radar nearly all year.” For those of you who may have missed it (or don’t really care! ), the Kansas City Royals baseball team of 2014 came one run (one win) away from winning the World Series. A feat that hadn’t been accomplished since the 1985 World Series win against the St. Louis Cardinals. Throughout the 2014 baseball season and even into the playoffs, they “flew under the radar” of baseball fans and sports columnists alike. I’m a Kansas and Missouri boy … why else would I use the Royals as an example?! Which is why some shocking news that I discovered in an article just a couple of months ago ended up in my Under the Radar file. What I read seemed much too incredible to use in one of my articles or even to consider it as legitimate, especially since there were no other sources or articles on that particular subject. However, just a few days ago, the subject was mentioned again through another source, but in the same context: the ongoing friction between the United States and Israel. The whole world knows that there is a personality clash between US President Obama and Israeli Prime Minister Netanyahu. Of even more concern is the developing rift between the US and Israel over strategic policies (the how, why, and when of things) pursued by each country in dealing with two contentious problems: (1) creation of a Palestinian State, the so-called two-state solution; (2) Iran’s persistent pursuit of a nuclear bomb. A brief recap shows that President Obama and his executive staff are on the verge of withdrawing traditional support of Israel in the United Nations. This not-so-veiled threat by the White House was ostensibly based on Israeli Prime Minister Benjamin Netanyahu’s statement that resumption of negotiations with the Palestinians—broken off in April 2014 when the Palestinian Authority signed a unity pact with its rival group Hamas—would not be possible. Although Netanyahu clarified his position by explaining that negotiations with an organization that refuses to recognize the very existence of Israel and one that avows Israel’s extermination is virtually impossible … at the very least an exercise in futility. Contrasted, however, with President Obama’s statement that the United States,” needs to rethink our approach,” towards Israel. As indicated in last week’s Eye of Prophecy article entitled The Seven Year Treaty, the majority of Israelis and many Palestinians do not want a two-state solution, with reasons given for this remarkable reality. One that is contrary to the US and EU’s determined but misguided objective to create a Palestinian State within the sovereign borders of Israel. And on the other hand refusing to attend the historical address to the United States Congress by Prime Minister Netanyahu this past March. Further refusing to accept the obvious danger of lifting or even relaxing sanctions against Iran and other negotiating points that would produce a much better deal than the tentative agreement reached recently with Iran. Just a few days ago, one of the high-ranking Iranian officers of the Republican Guard issued a challenging statement that Iran demands immediate withdrawal of all sanctions and would, under no circumstances, allow international inspection of their nuclear sites. So, is the United States for or against Israel? By concentrating on the consistent inconsistencies of President Obama and his staff you could, with a great deal of confused certainty, rightfully answer, “Yes!” It’s a: Definite maybe. As I said in last week’s article: *Note: What part of the Muslim Palestinian (paraphrased) objective that, “We want all of Israel and will drive the Jews into the sea to get it,” doesn’t our United States President and the European Union understand!? Is the repeated menace from high-ranking Iranian officials including their Ayatollah of “Death to America, Death to Israel,” just an idle threat? Hello? I think not. Back to the under the radar event that prompted me to retrieve the original story from my resource archives to be the main subject of this week’s article. What was it that I couldn’t believe with my own eyes, nor could I fathom that such a thing might possibly take place; something that apparently was kept under the radar by leading news agencies, both fixed and internet? (Don’t you love the word, apparently? It can be used when you’re not sure of anything but have an opinion on everything). I first read about this astonishing story (dated 3-14-15) in the on-line Prophecy News Watch website, which was taken from a Bethlehem-based news agency, Ma’an; which, in turn, referred to a Kuwati newspaper report published on February 28th, 2015. Absolutely astonishing! If, that is, it’s true. As indicated, another report of this under the radar incident recently resurfaced. Absent any denial or disclaimer from the United States or from Israel, the strong implication is that this unthinkable confrontation (in some form or another) actually did take place. Which is why the incident didn’t explode into an international after-the-fact crisis. Because it is all too incredible to imagine that the President of the United States would issue such a warning against Israel or consider such an action against the most loyal ally the United States has in the Middle East, indeed, in the entire world. Thus, the story was, for all practical purposes, dismissed out-of-hand; swept under the geopolitical rug. A global No Comment conspiracy if ever there was one. Well, it’s time to comment, hence this article. 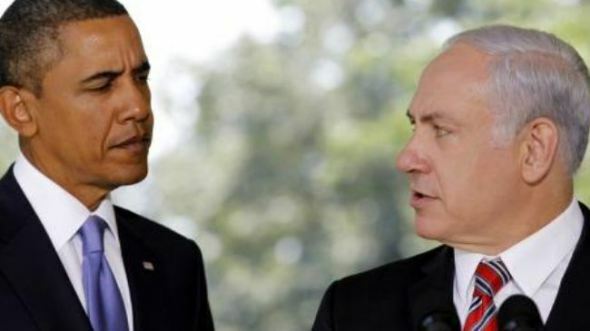 This clash between President Obama and Prime Minister Netanyahu, between the United States and Israel is especially unimaginable in light of very recent and very open statements by US Vice President Joe Biden. Who said that the US military has already been directed to prepare for a possible attack on Iran; this in response to what the US might do if Iran doesn’t comply with any or all of the conditions imposed by the P5 + 1 nations (which includes the United States) in the tentative agreement with Iran, scheduled to be finalized by the end of June, 2015. Let’s examine the rest of this remarkable story alleging that Obama forced Netanyahu to stand down from a preemptive strike against Iran over a year ago. Which makes it all the more ironically inconceivable … the fact that some of the Arab countries who are US allies would welcome an obliteration of Iranian nuclear sites (not the least of which are Saudi Arabia and Jordan). *Note: these behind-Israel’s-back secret talks with Iran is exactly what transpired last year, and has led to what has become a second phase or installment of these once-secret negotiations, which are now known world-wide. Another Note: Not so secret is Saudi Arabia’s “unspoken” resolve to grant Israel permission to use their airspace in route to a potential attack against Iran. More Notes: Brzezinski’s reference to Liberty was an Israeli (mistaken, friendly fire casualty of war) attack on an American ship named Liberty during the 1967 Six-Day War. Obviously, Israel apologized profusely for that inadvertent unfortunate incident. However, Brzezinksi’s analogy is seriously unreasonable and illogical. Why? It was clear then and still is that Israel’s assault against an American ship (during wartime) was totally accidental. Whereas, his inappropriate comparison of the United States shooting down Israeli planes would have been a deliberate attack on America’s strongest ally in the Middle East. If for no other reason than the names and sources identified in this near-miss episode between Israel and the United States (as well as lack of either country denying the reports), I’m inclined to accept the evidence as presented. But even if the dispute didn’t quite reach the near critical mass point of no return, it very well could happen … given the increasingly strained relations between the US and Israel over the past few years. A quick knee-jerk response is that the United States would have entered totally uncharted waters (airspace if you will) had Israel not stood down from its plan to destroy or at least disable Iran’s nuclear facilities; and certainly if President Obama had followed through with his warning to shoot down Israeli fighter jets. Benjamin Netanyahu’s decision to abort this preemptive strike was professionally and pragmatically appropriate. He clearly looked at the bigger long-term picture of Israel’s relations with the United States; although it must have been agonizing to him that the President of the United States would even think, let alone threaten, to shoot down Israeli jets on their way to a needed and justified mission. I’m sure Benjamin made the practical yet painful decision that this kind of preemptive strike could wait for another day. However, the literal fall-out of Israel’s abandoned mission is yet another year for Iran to accelerate their nuclear program. Though I’ve referenced the famous Scriptural passage several times in previous Eye of Prophecy articles, it certainly bears repeating. This Biblical prophecy with a combined blessing and warning comes directly from God to Abraham, the father of the Jewish race: “I will bless those who bless you, and curse those who treat you with contempt. All the families on earth will be blessed through you” (Genesis 12:3). Indeed, all peoples on the earth have been richly blessed by God’s glorious plan of redemption, delivered by and consummated through the Jewish Messiah, Jesus. As seen throughout Scripture, the blessings extend individually and nationally, physically and spiritually to those who support Israel, to those who seek to do her no harm. The warning is just as clear: Those nations (and individuals) who seek to harm Israel will pay a heavy price. 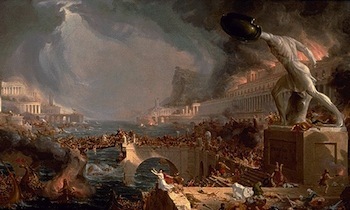 When God curses someone or something, including entire nations, it gives a whole new meaning to the proverbial phrase: “It’s not a pretty sight.” Down through the ages, the forgotten ruins of once powerful empires are graphic reminders that what God says he will do, he does. What he says will happen, happens. For example, one of dozens of Biblical passages that portray God’s heavy hand against anti-Semitic nations is as follows: “The Lord of Heaven’s Armies has sworn this oath: ‘It will all happen as I have planned. It will be as I have decided. I will break the Assyrians when they are in Israel; I will trample them on my mountains. 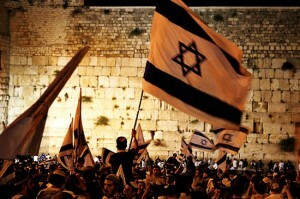 My people (Israel) will no longer be their slaves nor bow down under their heavy loads’” (Isaiah 14:24-25). Then to demonstrate that what would and did happen to Assyria (and earlier in this chapter to Babylon which hadn’t even come into power yet) would be a representative example of all nations who suppressed and oppressed Israel, the Lord continues: “I have a plan for the whole earth, a hand of judgment upon all the nations. The Lord of Heaven’s Armies has spoken—who can change his plans? When his hand is raised, who can stop him?” (Verses 26-27). If you don’t agree, then please tell me where I can find the once mighty empires of Egypt, Assyria, Babylon, Persia, Greece, or Rome? Although Germany has partially risen from the ashes of her defeat in World War II, she is nothing like the “invincible” Third Reich. All of these nations at one time or another, to some degree or another, trampled on Israel and the Jews. For that matter, where are the Philistines, Moabites, Edomites, Amalekites, Canaanites and all the other “ites” of the ancient Middle East. All of these dynasties, both small and large are gone. Only Israel remains! Israel and the Jews from Moses time can attest to God’s decree of what would happen to them if and when they deliberately disobeyed even the simplest of commandments, “You shall have no other gods before me.” When they abandoned the Lord their God, he abandoned them by withdrawing his protection of Israel from their enemies. In fact, the Lord used Gentile nations to severely punish Israel for what God often called, “despicable sins.” Not the least of which was copying the pagan practice of sacrificing their very children to pagan gods, such as Baal. But mostly from their refusal to acknowledge Melech haOlam (King of the Universe) as the only true and living Sovereign God. Covered in much detail in a three-part Eye of Prophecy series entitled Seven Times Seven (to the 4th power), published 1-25-14 through 2-8-14, and the final article in that series, The Omega Generation published 2-15-14 is a chronological history of God’s warnings against Israel coming to pass in series of catastrophic events in Israel’s history. Of paramount importance, however, is that when Israel recaptured the Holy City of the Holy Land in 1967, once again Jerusalem was restored as Israel’s (divinely appointed) Capital … center of both religious and political life. When that historical event took place, God’s discipline of Israel ended. The Times of the Gentiles was no more. No longer would Israel be at the mercy of any and all Gentile nations that sought her destruction. Why? Because God would once again be with Israel; once again Israel could and would be able to defend herself. Since Babylon conquered Judah in 586 BC, with the temporary exception of the Maccabees’ astounding (against all odds) victory over Antiochus IV around 164 BC, the Jews were unable to defend themselves, as they had no king or standing army powerful enough to resist her enemies. Thus, Israel eventually suffered the two greatest tragedies of all time: The Roman Conquest that led to the destruction of Jerusalem and the Temple in 70 AD, followed by the great Dispersion of Jews throughout the entire earth. Then the even more horrific event that isn’t even a full generation removed from when it took place during World War II … The Holocaust. Yet from the floods of dispersion and the fires of Nazi death camps, a miraculous event took place—the remarkable rebirth of Israel as a Sovereign State in 1948, just three years removed from the Holocaust. This, too, is part of the magnificent sweeping plan of God to restore Israel to preeminence among the nations of the earth. It is a precursor to the final spiritual restoration of Israel back to her God and, more specifically, to her Messiah whom they rejected (and many still reject) nearly 2000 years ago. But, the fact remains: God’s disciplinary action against Israel—as summarized in Leviticus Chapter 26—is finished; including God’s use of Gentile nations to accomplish his firm, but nevertheless (ultimately for their own good) loving discipline of his chosen people. Although God will accomplish his purpose for Israel which means that Israel’s inevitable glorious destiny is in God’s hands, the warning to those who would seek to hurt Israel (and certainly those who wish for Israel’s utter destruction) will apply right up to Messiah’s dramatic victory over the forces of evil at Armageddon. Whether this involves the complete annihilation of the Gog/Magog coalition that dares to attack Israel as graphically portrayed in Ezekiel Chapters 38 & 39 (I believe soon after the Rapture); or a (God-forbid) disastrous United States turnaround in their overt support of Israel, let alone the audacity to take on Israel in actual warfare, these anti-Semitic actions will be dealt with harshly by God. For that matter, what makes President Obama and our military leaders think they could win a skirmish with Israeli fighter pilots? 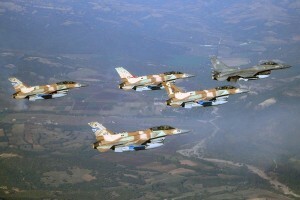 As good as our Air Force and Navy pilots are, Israeli fighter pilots are every bit their equal, if not better. Let’s put it this way: I wouldn’t bet against Israel, even if you gave me odds. For one thing, Israel’s resounding victories in all of her 20th and 21st century wars has been against all odds. One only has to read the amazing stories of each of these wars to realize that there’s no way Israel could or should have won; meaning not without the sovereign supernatural help of Almighty God. But an intriguing test as to who has the best fighter pilots is not even close to being the issue. Indeed, no such test should ever take place. I’m talking about repercussions far beyond who would win an aerial battle between the US and Israel. The very fact that the United States would even think of shooting down Israeli jets is absurdly insane. At the very least it demonstrates that our national leaders know nothing or care to know nothing about warnings issued by the true and living God. Warnings that have been proven true time and time again throughout history … the demise or destruction of nations that have persecuted Israel. If the United States turns on Israel in that fashion or in any fashion that jeopardizes Israel’s security and survival, then we need no longer ask God to, “Bless the USA.” At that point we would need to humbly get down on our individual and national knees and plead for God’s mercy, all the while restoring our support, literally and figuratively to Israel. Right now, this country is in more than enough trouble with our internal spiritual decay, not the least of which is the federally funded abortion mills and the impending Supreme Court decision on gay marriage. The very fact that such an issue is going all the way to the Supreme Court is a moral indictment of this once great nation. According to Scripture, in that regard we are guilty (before God) until proven innocent. But when we throw in an increasing attitude of dislike and disdain for Israel, our fate will be sealed by God’s seal of approval on the nation of Israel. When we seek to divide the God-given land of Israel (to the Jews) by creating a Palestinian State, we are challenging and even defying God’s solemn instructions to both the Jews and Gentiles, not to partition the land of Israel. What am I saying? That Israel is perfect? Of course not. Any one of us in America or anywhere in the world can differ with religious, political, or cultural ideas and practices. Just like we disagree with others right here in the United States … why we, for example, have two main political parties, Democrats and Republicans. No, I’m not talking about day-to-day differences in such matters. Rather, I’m referring Biblically to the fundamental decisions that adversely affect Israel’s security, her very survival. That includes abandoning Israel in the United Nations, and most certainly applies to any thought, word, or deed that would directly lead to economic (BDS) and especially military actions against Israel, the pupil of God’s eye as Scripture describes her. 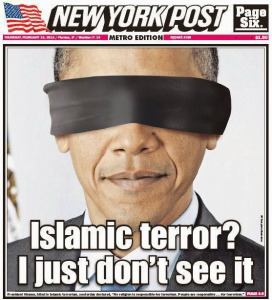 Neither you nor I, nor the United States of America, nor any person or nation on earth can fly under God’s radar. Yet, it’s very sad that so many try to do just that. “But the Lord is in his holy Temple; the Lord still rules from heaven. He watches everyone closely, examining every person on earth. The Lord examines both the righteous and the wicked …” (Psalms 11:4-5a). 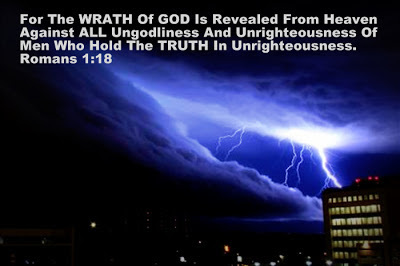 What is it the righteous can do to stem the mounting tide of ungodliness, evil, and violence throughout the world? First, we must clarify what the Bible means by righteousness … who is righteous and who is not. Righteousness is defined by Scripture as a right standing with God. No one has any innate or merited righteousness of their own. “There is none righteous, not even one” (Romans 3:10, NASB). Thus, those deemed righteous by God are those who have been given his righteousness through faith in the finished redemptive sacrifice of Jesus Christ when he took our sins upon himself. When we accept this at face value and place our trust in Jesus Christ, God will respond with amazing grace and matchless mercy. “For everyone has sinned, we all fall short of God’s glorious standard. Yet God, with underserved kindness, declares that we are righteous. He did this through Christ Jesus … People are made right with God when they believe that Jesus sacrificed his life, shedding his blood…” (Romans 3:23-25). What can we do? Stand up and be counted. “Let the redeemed of the Lord say so… (Psalms 107:2). Intercede by praying for America. 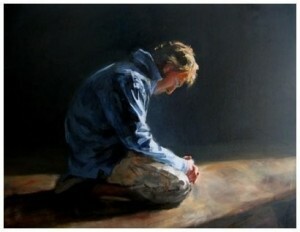 God listens to intercessory prayer. He did so with Abraham, who asked God six times, each time lowering the count of the number of righteous in Sodom and Gomorrah needed for God to spare those cities from utter destruction. If there had been even ten righteous (those who acknowledged and placed their trust in God), these ultra-wicked cities would have been spared. What more should we do? Although God’s instructions to the highest leader of Israel (King Solomon) was specifically intended for the Jews and Israel, the principle is every bit applicable to the United States of America, to Brazil, to Italy, to any nation on earth: “Then if my people who are called by my name will humble themselves and pray and seek my face and turn from their wicked ways, I will hear from heaven and will forgive their sins and restore their land” (II Chronicles 7:14). Pray with me that the Lord our God, for the sake of the righteous, will spare America from judgment until after the Rapture.